BEARD TONY Fond memories of our early years. Taken too soon. 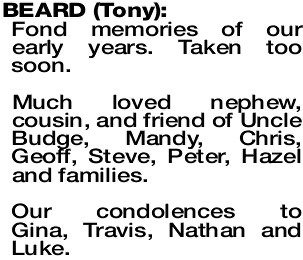 Much loved nephew, cousin, and friend of Uncle Budge, Mandy, Chris, Geoff, Steve, Peter, Hazel and families. Our condolences to Gina, Travis, Nathan and Luke.